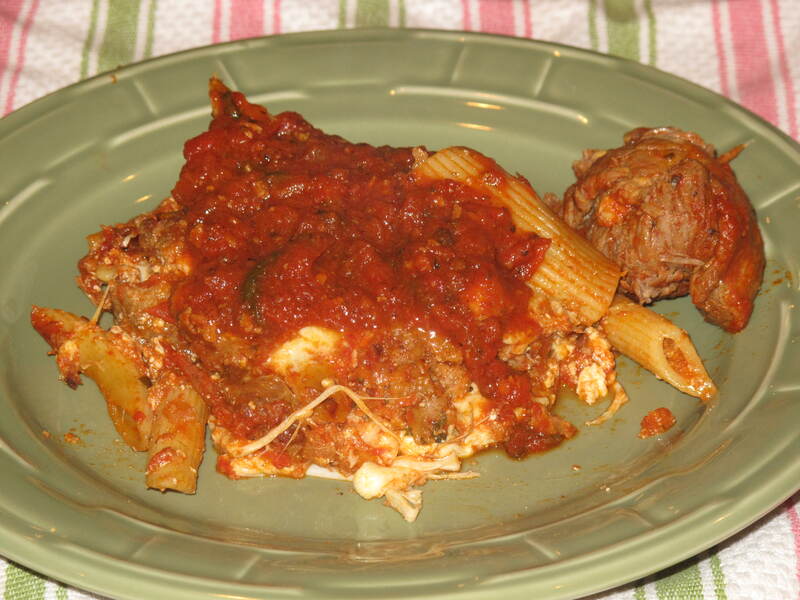 This is baked ziti with a piece of Italian braciola on the side. 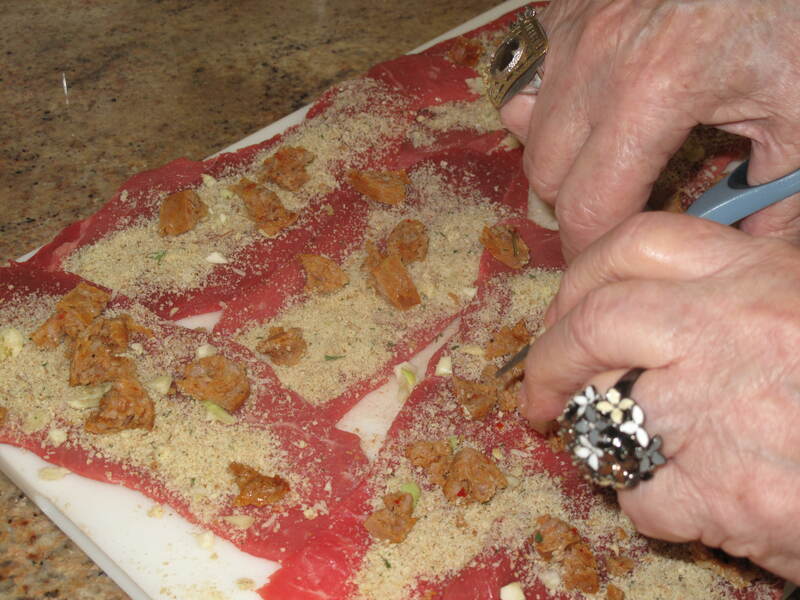 It was made by our own Notorious B.I.G.–our Brooklyn Italian Grandmother. Yes, she is back and making another one of her all-time favorites. Most Sunday dinners always include her famous sauce and meatballs/sausage, but she doesn’t always include braciola. 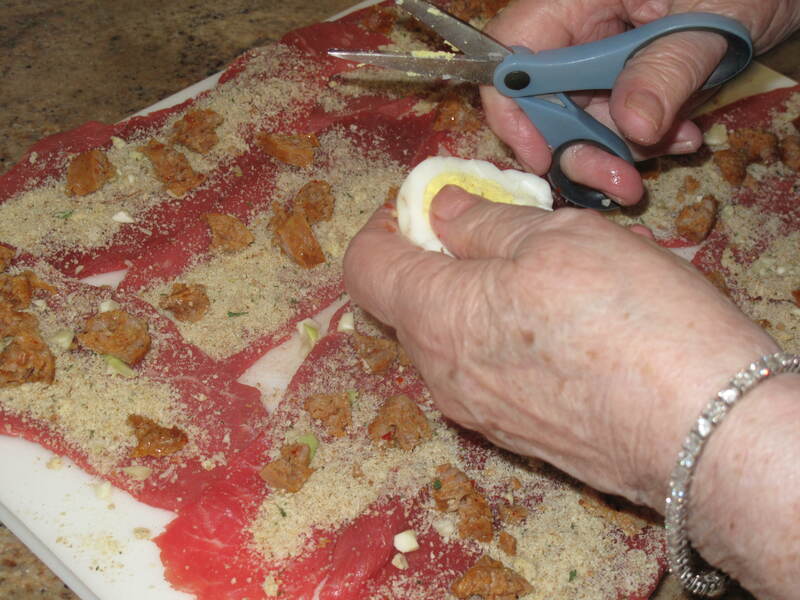 Her braciola takes thin slices of sirloin, adds a seasoned breadcrumb mixture along with cheese, egg and sausage and then they are rolled and secured with a wooden toothpick or cooking twine. After lightly browning them in olive oil, they are added into her gravy (sauce) to cook along with the meatballs and sausage. When I first met B.I.G., it was one of the first things she made and served to me. I loved it that very first time and all the times since then during the thirteen years I have known her. There is something so delicious about this little Italian meat dumpling that stands its own against the big pile of macaroni that always sits right beside it. I really don’t need the pasta at all. I could be very happy with just the braciola. I have always wanted to learn how to make it and I have finally gotten my wish. So here is B.I.G.’s recipe for Italian braciola–one of the best I’ve ever had. 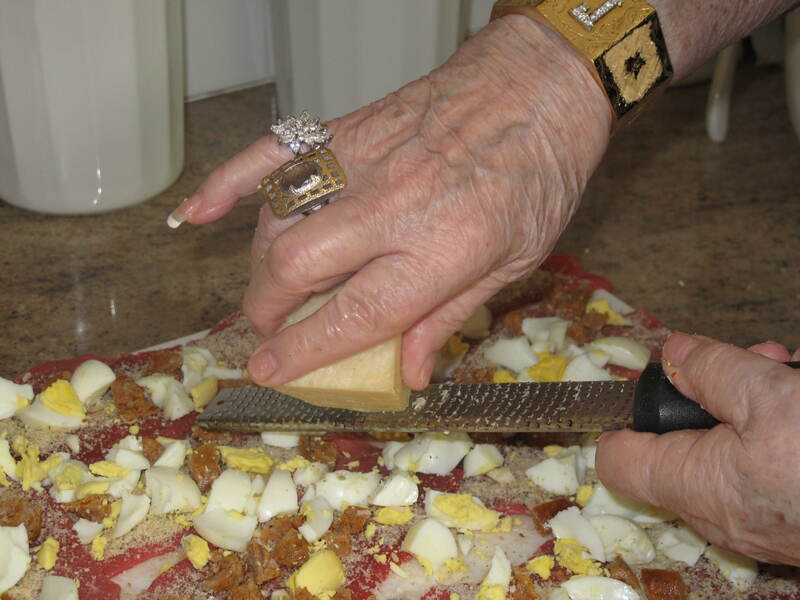 It all starts with the same bread crumb mixture she uses in her other recipes. Begin by preparing the Italian sausage link and the hard-boiled eggs and let them cool until they can be handled. While they are cooling, combine the garlic, bread crumbs, cheese, sopressata, parsley, salt and pepper in a medium bowl. Mix all ingredients until combined with each other. 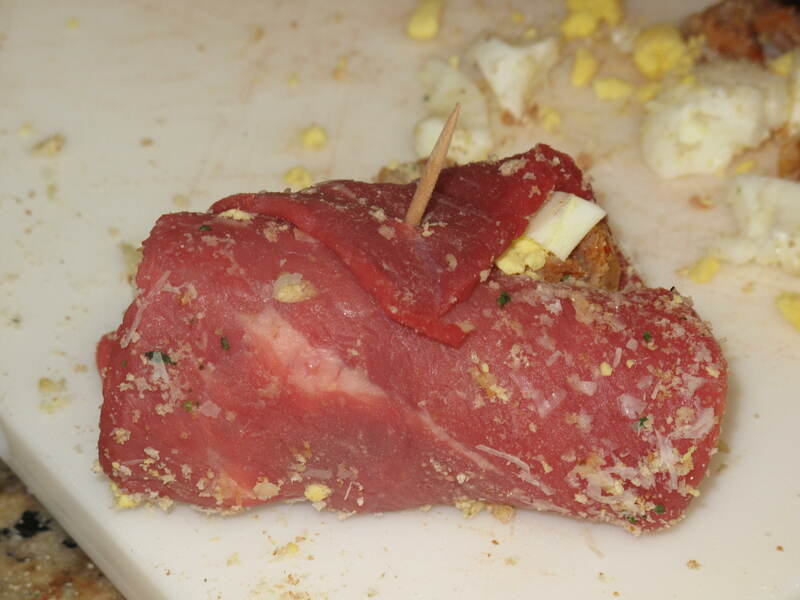 Lay out meat slices and sprinkle bread crumb mixture over the top of each slice. Next, take the cooled sausage and remove the skin. Chop it into small bite-sized pieces and spread them on top of the meat slices as well. She’s back with jewelry galore. A ring on each hand for balance. You don’t want one hand being heavier than the other. Do the same with the boiled eggs. Chop the eggs into small bite-size pieces and spread them on top of the meat slices. 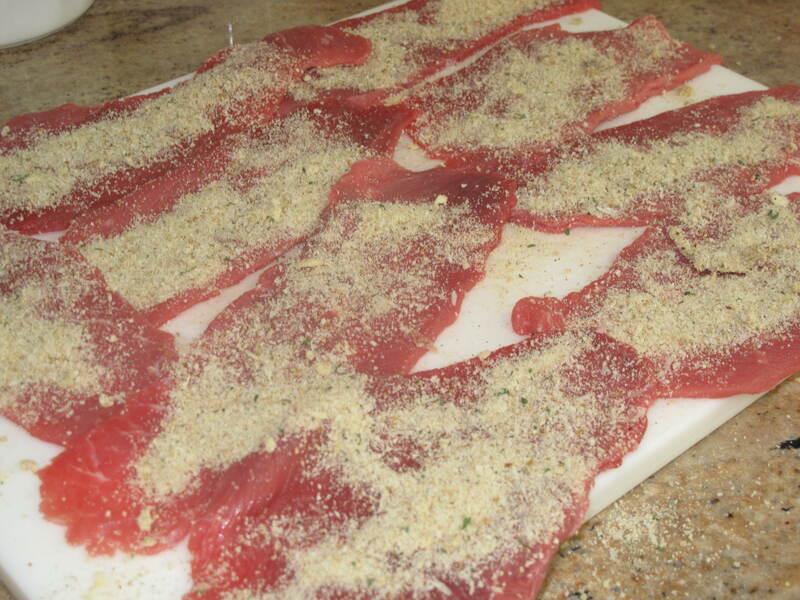 Finish by grating some additional parmesan cheese on the finished meat slices. A diamond ring, a gold ring and a gold bracelet. The only way to shred cheese. Carefully roll each meat slice and secure with a wooden toothpick. You may need more than one toothpick to ensure that the inside stuffing does not come out during browning and then simmering in the gravy. Heat the olive oil. 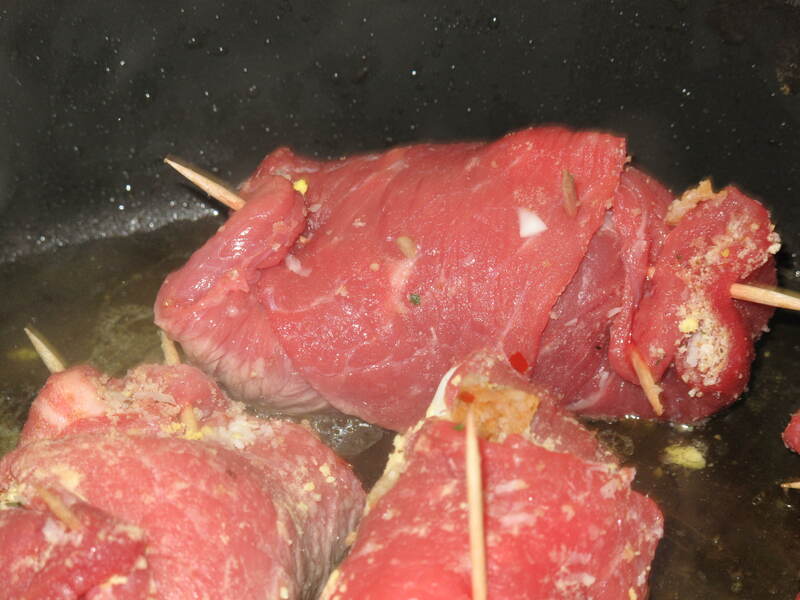 When hot, add each braciola and lightly brown the meat. Continue turning until they are lightly browned on all sides. At this point, you can continue cooking if you would like until the braciola are completely cooked and eat them on their own. Most of the time, you will put them into your prepared gravy (sauce) after lightly browning them and let them continue cooking in the simmering gravy (sauce) until they are completely cooked through. I have been to some of the finest Italian restaurants in the world and have quit ordering braciola because nothing compares to the braciola made by B.I.G. I tend to find that many times the restaurants where I have ordered it bring it out with little taste. Maybe they are scared to serve it to large numbers with too much seasoning in it or our family just loves large amounts of flavor coming from garlic, sopressata, egg, cheese and sausage? Who knows! However, these braciola pack a lot of flavor and taste. I can see them being eaten on their own with a salad or a side of broccoli rabe or as part of the traditional Italian dinner with macaroni and gravy. Whatever way you choose, you are in for a treat. Man, our Notorious B.I.G. knows how to cook. Did you learn to cook on your own or with the help of a relative like our Notorious B.I.G.? This entry was posted in Food and tagged Acorns, Blog, Cooking, Family, Food, Fun, Italian, Life, Lifestyle, Love, Main Dish, My Life, Photos, Recipes. Bookmark the permalink. I love when B.I.G. visits. This dish is so great. Bet she brings in the best sopressata from NY. I once was making a batch of braciola for my in laws, when my father in law came over scrunched up his nose and said I thought we were having meatballs. I had to tell him, we were having those too. This was quite a relief to him. Anyway, I watched my mom cook a lot growing up and then practiced a lot in college on my roommates. Hi Rufus’. Thanks for the comment. Yes, we always get meatballs…that’s a given. The braciola is a treat. Glad I know how to make it now. Come back and visit soon. I am a self taught cook who has failed. When first married I fixed spaghatti for my husband and just boiled the spaghatti. drained and then put in a big can of tomato juice in it and allot of raw onion for the punch.